Dynamic location surrounded by subtropical jungles and mountains. Take a short walk and play out at the beautiful Kominato beach, rare sand beach for Chichijima. Under the sky full of stars, have a camp fire to light you up. Build a tent and watch the stars, have a barbeque with your family and friends. You can enjoy outdoor camp style besides staying in the bungalow. Feel the jungle, ocean, earth and space. That is when you stay at Shanti Bungalows. Single traveler, couple, family are all welcome. Reserve the hole site with a group, and have a party. Any other plans you wish, please let us know. 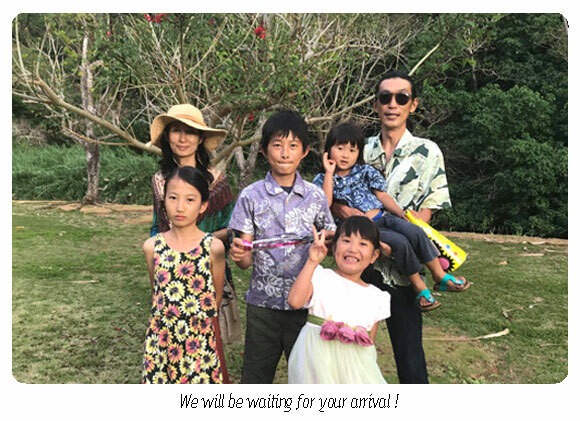 We will be waiting for your arrival in a supreme location, 2000㎡ of land in Ogasawara Islands.